The lumpy surface of the Michelin Pro-Tek Max tubes now in the back tire of our bikes can’t be patched, which means (being that type of guy) I must carry along a spare tube in addition to a handful of CO2 cartridges. So, having cleaned out my tube stash, I ordered a pair from an Amazon supplier, not my usual bottom-dollar eBay suppliers, clearly described as fitting the Schwalbe Marathon Plus 700x35C tires. Yes, you are right, you also didn’t bought wrong items for your tire. we marked the 700×28-32, just for our manufacture to difference from another big size from 700/35-45C, because if we marked the size 700×28-35C, sometimes , the worker will packing 700×35-45c into the packing, and let the tube can not used for the 700x35c customer.. 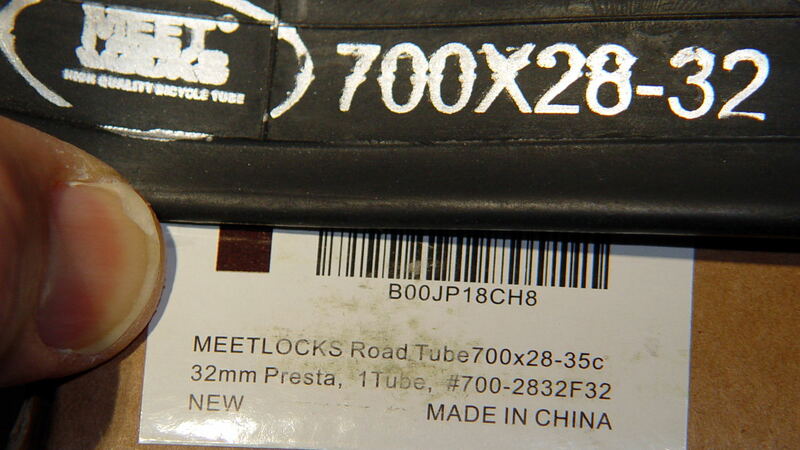 It turns out the tube has 35-38 embossed into the rubber, so it’s not obvious the tube would fit into the smaller 28-32 size tires as labeled. It all depends on what you trust: the mold, the tube’s stamp, the box label, or the advertising. Next time around, an event I hope (but do not expect) lies far in the future, I’ll spend a bit more for what will undoubtedly be the same tube from the same factory, but from a vendor buying enough QC to ensure the workers know what they’re packing. Having all the labels match would be a definite bonus.